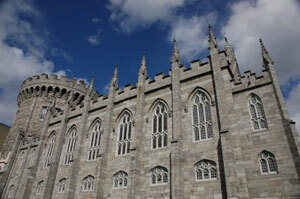 When you are in Dublin, take a tour of Dublin Castle Ireland and get a quick history of Irish government. The castle was the center of British rule in Ireland until the Irish free state began in 1922. 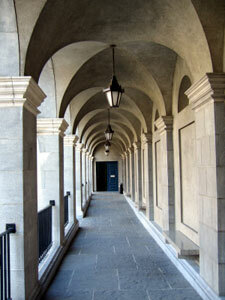 Over the centuries, the buildings have changed from a fortress to an administrative complex. Today, the castle is used for State receptions, presidential inaugurations, European Union meetings and other state occasions. 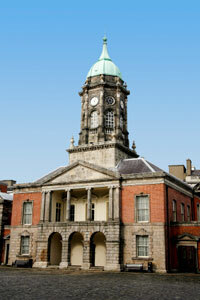 While you are in Dublin, it's worth a trip to the government buildings to get a glimpse of the history of Ireland. Construction of Dublin Castle Ireland started in 1204 when King John ordered Meiler FitzHenry to build a castle to defend the city and administer the new territories in Ireland. FitzHenry chose a site on a ridge that had been used for Henry II's royal palace. The castle was finished in 1228 and remained until the 1600s when most of it was rebuilt.The castle was originally a rectangular area surrounded by walls with a round tower at each corner. The River Poddle, which is now underground, came up to the walls on two sides and created a moat on the other two sides of the castle. The "dark pool" or "Dubhlinn" on the side of the castle gave the city its name. Queen Elizabeth I was in power in the 1500s during the conquest and religious persecution of Ireland. 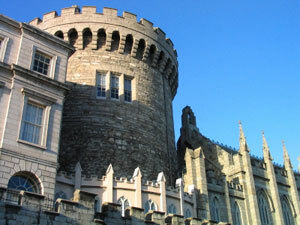 During this dark time, Dublin Castle held prisoners and traitors' heads were exhibited on spikes over the gate. In 1684 much of the original medieval castle was destroyed by fire. Apartments were built and later remodeled. The two courtyards now have a Georgian look. The "Powder Tower" has the original medieval style. The state rooms of the castle were used as a hospital during World War I and again were used during the Easter Rising in 1916 to house the dead and wounded. James Connolly, one of the injured leaders of the uprising, was held prisoner, courtmarshalled and condemned to death in the castle. Dublin Castle Ireland was the British headquarters during the Irish War of Independence,but Michael Collins' group infiltrated. The castle became his headquarters during the War.In 1922 Collins, on behalf of the new Irish government, was granted the castle. The State Apartments, the Castle Hall, the Bedford Tower and the Powder Tower are all elegantly redecorated today. The Picture Gallery and Wedgewood Room display beautiful portraits, paintings and plaques. 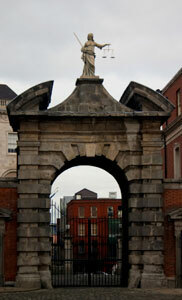 The entrance to Dublin Castle are in Dame Lane and Ship Street, off Castle Street, Dublin 2. Forty-five minute tours are given throughout the day. 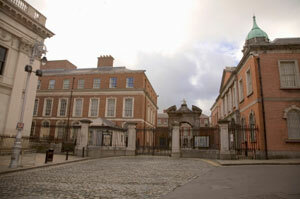 Dublin Castle is under management of the Office of Public Works.